You wouldn't think I'd have a full routine's worth of pink skincare products...I think colours like blue, white, black and green are more common in skincare packaging. But as it turns out I do and a few months ago I posted a pink themed skincare routine on Instagram. 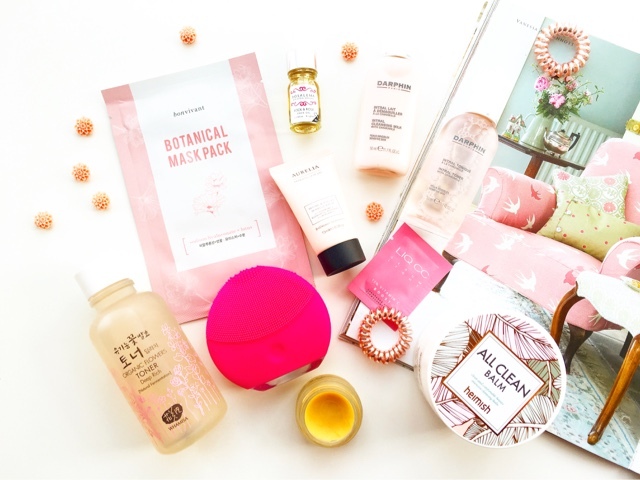 It proved very popular so I thought I'd put together a post talking about the products in my pink skincare routine. Heimish All Clean Balm | £16 is the most beautifully designed chunky tub with rose gold touches and comes with a little spatula too. The balm itself is one of the best I've tried and I always look forward to using this. 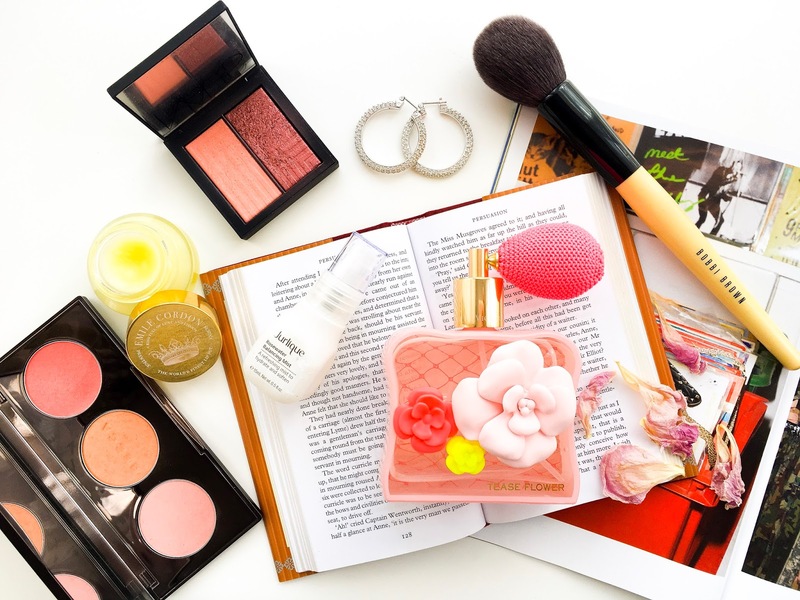 It contains shea butter, donkey milk, and a whole host of fruit and floral extracts and natural oils. I take one spatula scoop between my fingers and it begins to melt instantly and then I apply it over my face and eyes. It breaks down and melts the makeup off so gently without irritating my eyes or stripping my skin. After removing with a warm damp flannel, my face is clean and plump. This would be good for even sensitive skin types and I don't find the shea butter to be too pore-clogging as it's on the skin for so little time. Darphin Intral Cleansing Milk | £28 full size is meant to be able to cleanse makeup but I much prefer oils and balms for that and cleansing milks and creams for skin cleansing. This is a deluxe sample of the high-end cleanser and of course the soft pink is the same as the full size bottle. This is an incredibly gentle cleanser that contains chamomile, aloe and hawthorn to really soothe the skin and watermelon extract to even out skin tone. I love how soft and hydrated my skin feels after using this. All skin types would appreciate this cleanser especially those who find their skin to get irritated very easily after the cleansing process as this would calm it right down. Aurelia Probiotic Skincare Refine & Polish Miracle Balm | post | £57 full size comes in a sophisticated striped blush pink tube and can be used as an instant exfoliator or as a mask. I prefer using it as a mask as I'm not really into manual exfoliating scrubs these days and I find that 5 minutes on the skin really boosts my skin's radiance, leaving my face smoother and brighter. This contains a blend of essential oils to lend to the lovely scent and to help the product emulsify wonderfully and fruit extracts, the enzymes from which are activated to exfoliate the skin's surface. Also, rice bran beads are used for manual exfoliation. If you're looking for an exfoliator that doesn't contain micro-beads or other synthetic 'nasties' that will transform your skin from dull to glowing, then you should give this a go. Darphin Intral Toner | £28 full size is a very gentle toner, similar to the cleansing milk from the same range, that helps to cleanse and calm the skin. This alcohol-free toner is targeted at helping even the most sensitive skin-types and helps reduce the appearance of redness. I have used it with a cotton pad as a soothing last step in cleansing toner and also patted into the skin as a calming hydrating toner. And both ways it works wonderfully. 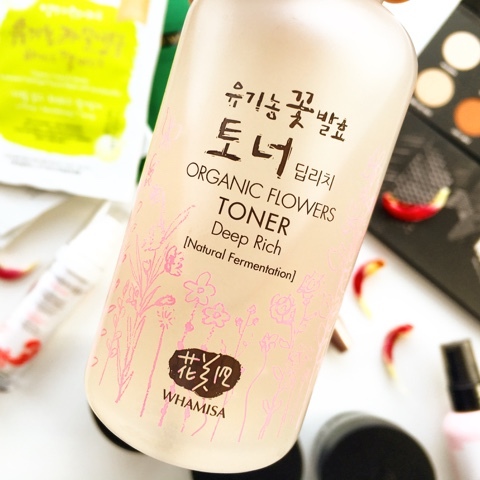 Whamisa Organic Flowers Deep Rich Toner | post | £28.25 is a super hydrating toner made with natural and organic fermented extracts for a luxurious skin drink that plumps up the skin beautifully. This is a very popular hydrating toner loved for its ability to nourish and soothe skin instantly, leaving it feeling bouncier to the touch and looking healthier and happier by boosting hydration. This is alcohol-free and is packed with a wonderful host of botanical extracts and oils such as oat kernel extract, dandelion extract, argan oil and avocado oil. I use this when my skin is particularly thirsty or when I want to really indulge in a full on routine. And of course the pretty packaging makes this a special treat all round. LIQ CC Serum Light Vitamin C Boost* | £17.90 is the only pink serum I have in my collection and while this is a sample, I have previously used up a whole bottle of the rich version of this serum. It contains a complex of 15% Vitamin C + Vitamin E to provide daily antioxidant protection for the skin while gently hydrating the surface. This serum is good for anyone looking for an affordable vitamin C serum to slowly boost the level of radiance in the skin. Bonvivant Botanical Mask Pack | $1 is one of the prettiest sheet mask packaging designs I've seen, combining pastels with a clean, modern and sophisticated look. The mask itself is one of the nicest materials I've tried that is created from eucalyptus derived elements for a mask that fits like a glove. The serum restores dry, lacklustre skin and contains lotus extract to moisturise and protect the skin and deliver intense hydration. This is the perfect way to seal in all the hydrating layers and give the face that last plumping step to ensure it stays looking plump and radiant for longer. All the masks I've tried from this range are really good, but of course I think the pink is my favourite. Rosalena Rock & Rose Facial Oil | £42 is packed with antioxidant-rich ingredients for a dreamy scented, brightening facial oil housed in a gorgeous little bottle. The uplifting scent makes this one I like to reach for both day and night and find it to be a great way to end my skincare as it leaves my skin soft and luminous. A blend containing pumpkin seed, safflower and prickly pear oils help to rejuvenate the complexion alongside other super nourishing and protective natural ingredients. My little bottle is only 5ml but I have managed to get so many uses out of it already, meaning a little goes a long way.